Recently, I’ve been using rice paper wrappers to make various versions of spring rolls. If you haven’t worked with rice paper before, HAVE NO FEAR! When treated gently, and with care, they can be your new best friend. Not to mention they are unbelievably cheap! You can buy a package of rice paper wrappers for under $2 at a local Asian market. Rice paper is usually gluten free, only slightly cooked, and adds an edge to just your basic tortilla. Try to assemble your fillings in a horizontal line, across the bottom rice paper. Once you’ve stacked them, pull the bottom part of the rice paper over the fillings and start rolling upward, tucking and GENTLY securing to a hold. Slice in half, and serve. Fillings can range from any favorite cold filling, a salad you bought at the market, leftover veggies with your favorite salad dressing. Go for color! They look so pretty when sliced and served! 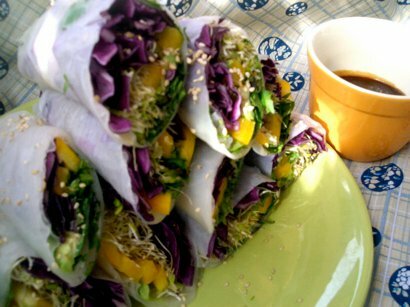 My favorite fresh veggie filling consists of shredded purple cabbage, julienned yellow bell peppers, alfalfa sprouts, sliced avocado, fresh chopped cilantro and mint, with a sprinkle of sesame seeds. For a dipping sauce try nama shoyu with some thinly sliced scallions. In the mood for something more hearty? How about some slices of Tofurky, a spread of tofutti cream cheese, fresh chives, sliced avocado, spring mix, and a dash of hot sauce! This entry was posted in Gluten Free, Raw Foods and tagged gluten free, raw, rice paper, vegan, vegpod.